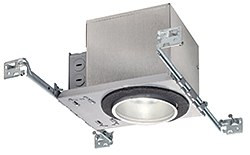 WarmDim for the Juno Generation 3 LED Downlights Series has a micro-processor controlled light engine to warm the LED color temperature while dimming, taking the LED color temperature from 3000K to 2000K. Uses 14 watts and produces over 600 lumens. Offered in 4-, 5-, and 6-inch new construction and remodel housing styles.